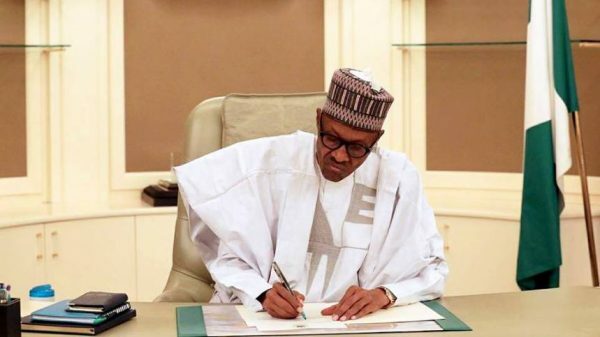 President Muhammadu Buhari has confirmed the appointment of over a dozen new Chief Executive Officers (CEOs) of MDAs. This is contained in a circular by the Secretary to the Government of the Federation (SGF), Mr. Boss Gida Mustapha, signed on his behalf by the Permanent Secretary, General Services Office (GSO), Office of the Secretary to the Government of the Federation (OSGF), Mr. Olusegun Adekunle. The appointees are Prof. Okechukwu Ukwuoma, Director-General, National Centre for Technology Management (NACETEM), for a second and final term of four years with effect from 22nd July, 2018; and Chief Medical Director (CMD), Obafemi Awolowo, University Teaching Hospital, Ile-Ife, Prof. Victor Adebayo Adetiloye, for second and final term of four years, with effect, from 22nd September, 2018. The new appointments for an initial term of four years are: Abdul-Jalil Suleiman, DG, Directorate of Technical Cooperation in Africa (DTCA) with effect from 17th September, 2018; Chief Medical Director (CMD), University of Uyo Teaching Hospital, Dr. Bassey Emem Abasi, with effect, from 22nd September, 2018. Appointed for the Electricity Liability Management Company (NELMCO) are Mrs. Mojoyi Oluwa Dekalu-Thomas, Executive Director (Liability Management); and Mrs.Chinedum Olisakwe-Lawrence, Executive Director (Corporate Services) for an initial term of four years with effect from 20th September, 2018. For Border Communities Development Agency (BDCA), Capt. Junaid Abdullahi was appointed the Executive Secretary for an initial term of four years with effect from 22nd September, 2018. President Buhari also confirmed the appointments of Folashodun Adebisi Shonubi, as Deputy Governor, Central Bank of Nigeria (CBN), with effect from 17th October, 2018 for a period of five years in the first instance. Mr. Banire Muiz Adeyemi was appointed Part-Time Chairman, Asset Management Corporation of Nigeria (AMCON), with effect from 17th October, 2018 for a period of five years. Also is Sule Yakubu Bassi, appointed Secretary, Nigerian Diaspora Commission, with effect from 19th October, 2018 for an initial period of four years. For Federal Judiciary Service Commission (FJSC) Senator Abba Ali and Mr. Mohammed Sagir were appointed members (Non-Legal Practitioners), for an initial period of five years with effect from 24th October, 2018. For the National Centre for Agricultural Mechanization (NCAM), Ilorin, Kasali Muideen Yomi, was appointed Director/CEO, for initial term of four years with effect from 28th October, 2018. While for the Agricultural, Rural Management Training Institute (ARMTI), Ilorin, Dr. Olufemi Ajayi Oladunni, Director/CEO for initial term of four years with effect from 28th October, 2018; and at the Nigeria Hydrological Services Agency (NHSA), Clement Onyeabo Nze as Director- General for initial term of four years with effect from 28th October, 2018. For the Board of the Petroleum Product Pricing Regulatory Agency (PPPRA), Clement Isong is to replace Mr. Thomas Obafemi Olawore as member with effect from 28th October, 2018; while for National Salaries, Income, Wages, Commission (NSIWC), David Isho Nyikyaa, was appointed Secretary with effect from 1st November, 2018. The Special Investigation Panel for Recovery of Public Property, Obinna Francis Ogwuegbu, was appointed Secretary with effect from 2nd November, 2018; and Dr. Akinrinola Samuel Akintunde was appointed as Provost for Adeyemi College of Education, Ondo, for an initial term of four years with effect from 6th November, 2018. For the Federal Polytechnic, Ile-Oluji, Ondo State, Prof. Emmanuel Adebayo Fasakin, Rector for a second and final term of four years with effect from 6th November, 2018; and for Nigeria Mining Cadastre Office, Obadiah Simon Nkom, as Director-General/CEO, for an initial term of four years with effect from 12th January, 2019. The President enjoined the new appointees to regard their appointments as a call to National Service and to carry out their responsibilities with uprightness, diligence and prompt response to the yearnings of the public. President Buhari also charged them to bring their wealth of experience to bear in the discharge of their responsibilities.